To launch the antique jewellery stores’ brand and celebrate the opening of it’s very first boutique in central London. 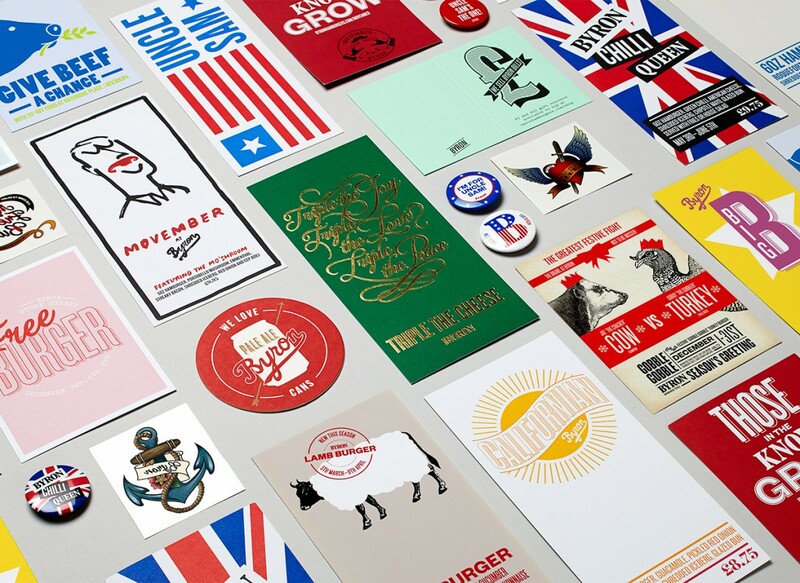 Piccadilly Vaults asked Charlie Smith Design to create the brand identity, packaging and supporting collateral in time for their Valentines Day opening. The founders of Piccadilly Vaults had a fascination and expertise in jewellery history and craftsmanship. Having amassed a collection of fine antique jewellery, they wanted to bring their unique collection to the market and open their first emporium of fine antique jewellery in the heart of the Piccadilly Arcade, London. The visual identity for Piccadilly Vaults needed to reflect the unique style of the jewellery, positioning the brand as a place to go for unusual treasures. 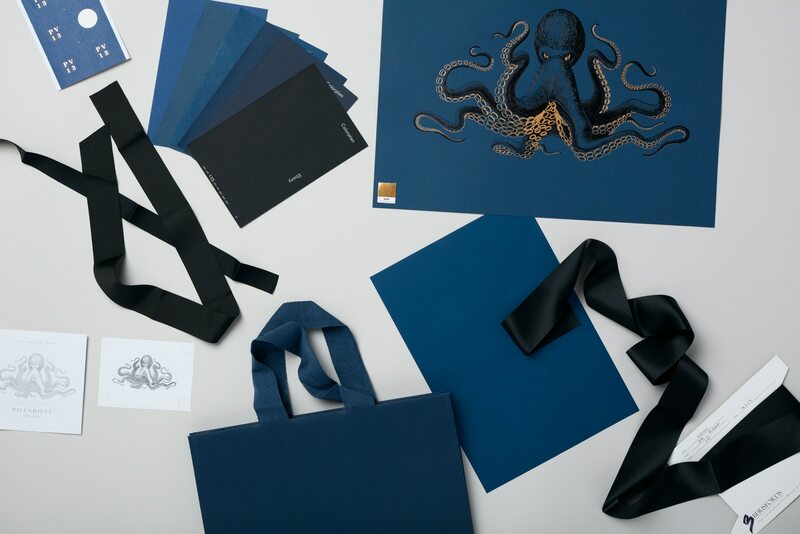 From the outset, we discussed the idea of a kraken, a mythological deep-sea dwelling creature becoming the central part of the visual identity. We used a serif typeface for the logo type and typographic treatment throughout the identity. This felt appropriate both as a historical nod to the antique jewellery but also to communicate the premium quality of the brand. In order to create a unique logotype we edited a number of the letterforms to add more character. 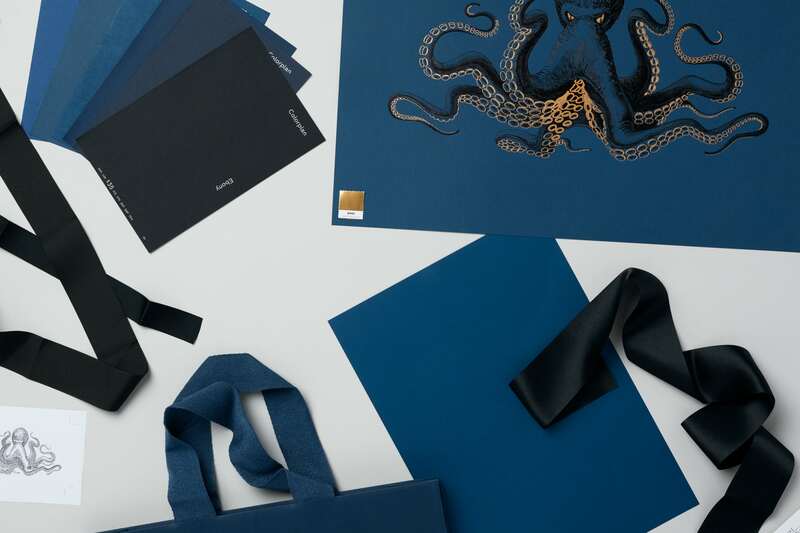 We settled on a colour palette of dark inky blue, black and gold quite early on, as it felt both premium and entirely appropriate for the brand. 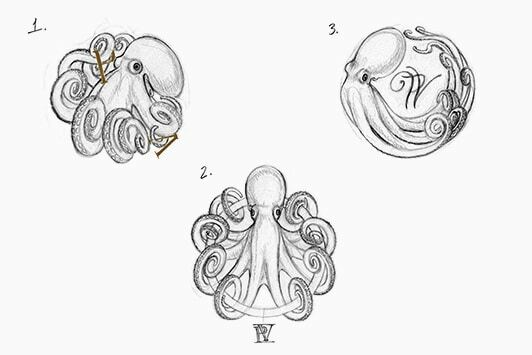 The kraken lent itself to quite a detailed illustrative style, and could be paired with a more classic, but ownable logotype. The combination of the design and print finishes aims to be timeless, premium and luxurious, reflecting the intricate and unique nature of the jewellery pieces. 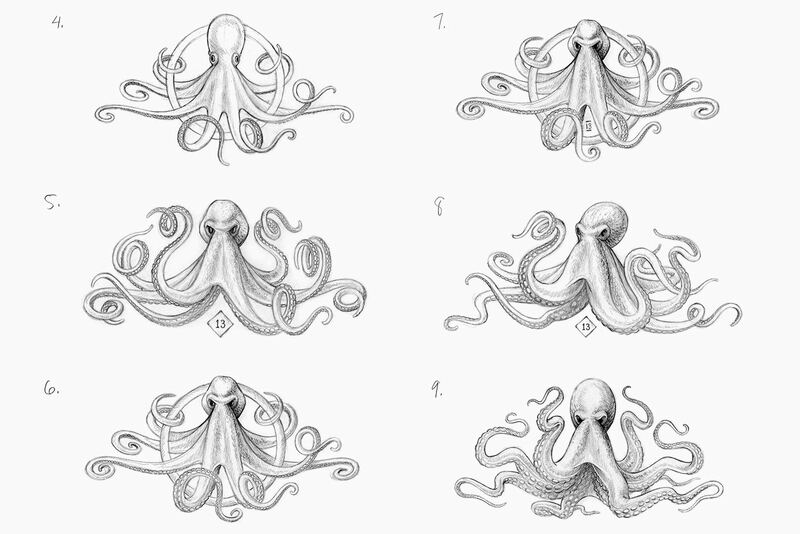 We set about researching illustrators who’s approach and style would be a good fit for the project. 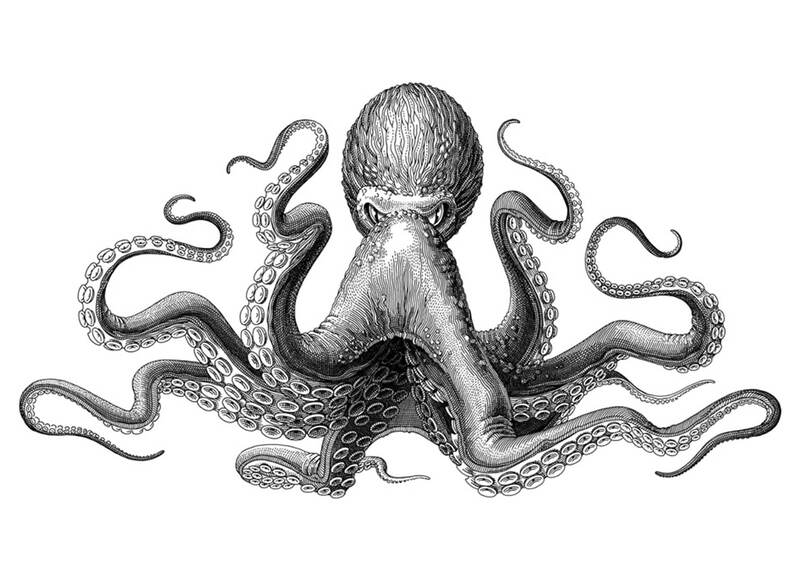 We came across Olivia Knapp, an American based illustrator who has a very intricate, cross-hatching style that we loved, and so commissioned her to produce a detailed illustration of the kraken. 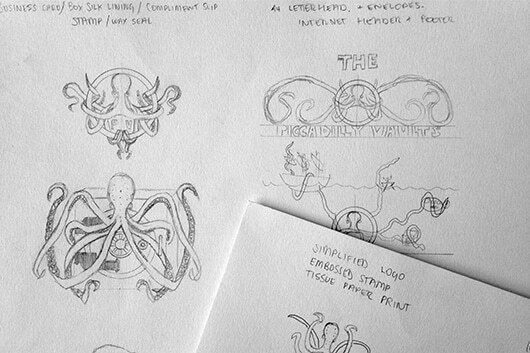 The process involved many rounds of sketches and refinements to develop the krakens character. The desired illustration would have both menace and beauty about it, whilst appearing to be a centuries old creature lurking in the depths of the ocean. We hoped to foil the kraken in two colours; black for the body, with gold being used as a highlight for the eyes and the suckers on its underside.